We were very pleased to read about one of our neighbouring diocesan priests who made it to the national news headlines today, with a story about the priest chaplain on the fateful maiden voyage of the RMS Titanic, which sunk 103 years ago this weekend. Even though he doesn’t have a connexion with our Order, we thought we would share the story of this priest, to spread devotion to our local hero. 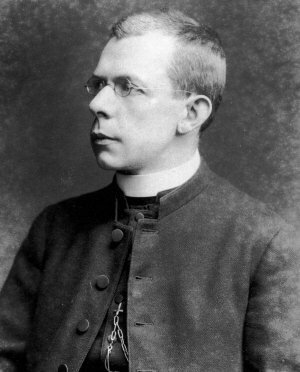 Father Thomas Byles followed the example of his older brother and converted to Catholicism as a young man while he was studying theology in Oxford, in 1894. Incidentally, he was received into the Catholic fold in the beautiful church of St Aloysius that is now home to our friends, the Oratorians. After spending some time as a tutor, and then as a seminarian in Oscott, he travelled to Rome to finish his studies, and was there ordained to the priesthood in 1902. At that time, Essex was still part of the Archdiocese of Westminster, and after a curacy in west London, and another near Tiptree, in 1905 he became parish priest of Ongar, just to the west of Chelmsford. In the mean time, his Catholic brother had moved to New York, and was engaged to be married. Naturally, Father Byles was asked to celebrate this family wedding, and so booked a second-class ticket for £13 on the maiden voyage of the Titanic, which was due to leave in Easter week, 1912. After celebrating the sacred mysteries for the last time before heaven in Ongar that Easter, he travelled to Southampton, and there boarded the ship. In his bag, he brought with him an altar stone, and the appropriate appurtenances to celebrate the Mass. The captain gave permission for daily Mass to be celebrated. After all, most of the passengers and crew, being poor, were Catholic. On Low Sunday, he celebrated Mass twice, first for the second class passengers, and then for the third class passengers, preaching in both English and French. In his last sermon – excepting that eternal sermon that was the sublime and holy manner of his death – he preached about the necessity to use prayer and the sacraments as a life-vest in the spiritual shipwreck of human life. Late that night, he went on deck to recite his breviary. As midnight approached, he saw the ship strike the iceberg, and immediately went downstairs to steerage to bring comfort to the people, and he heard many confessions. As it quickly became clear that the boat was sinking, he led many people from the bowels of the iron ship to the deck to try to find room on the lifeboats, room on which, of course, was woefully inadequate. Although he was twice offered an opportunity to escape on a lifeboat, he refused to run away from his little flock, and remained with them, and continued to hear confessions, recite the rosary with them, and encourage them as they all prepared to receive their eternal reward. As the clock passed two in the morning, the stern began to rise, and a hundred terrified third-class passengers were kneeling before the priest as they together recited the Act of Contrition. As the icy waves lapped higher and higher, he bestowed the General Absolution to all those who had not managed to escape, and, along with 1,500 other poor souls, Father Byles perished. His body, never recovered, was given up to the ocean, while His Blessed Mother, the Star of the Sea, guides his priestly soul and the souls of his little lambs through the spiritual waters of purgatory to Harbour in heaven; there, they will celebrate, not his brother’s wedding, but the marriage feast of the Risen Lamb. His brother William married his fiance, Katherine, at the appointed time, but, there were no celebrations. Instead, the wedding having been celebrated early in the morning, as was then customary, the bridal party exchanged their festal garments for funerary ones, and returned to the church to attend the Requiem Mass for their brother. William and Katherine Byles travelled to Rome later than year, and were granted an audience with the holy Pope Pius X, who comforted the couple in their grief, and called Father Byles a Martyr for the Church. Although here in Essex we have a particular devotion to Father Byles, it would be unjust not to mention the two other priests who were traveling on that voyage. Father Josef Peruschitz OSB was a monk of Scheyern Abbey (half-way between Munich and Ingolstadt). Having spent Holy Week at St Augustine’s Ramsgate, he was traveling to Minnesota to begin a new teaching job in a Benedictine school. Like Father Byles, Father Josef said daily Mass on the ship, and preached in German. He was well-remembered, since he had a beard and wore a soup-plate hat. He was also offered a place, and refused it, preferring rather to stay with the passengers and absolve them; other passengers, who in those last moments declined the salvation offered to them, instead spent their last breath ridiculing the priest. He perished along with the 1,500 other souls. Father Juozas Montvilla was a diocesan Unitate priest in Russian-occupied Lithuania. The Catholics were persecuted by the Russian state, and so had to earn his living working as a writer and artist, undertaking pastoral work in secret. Realising, however, that he would be unable to public practice his priesthood, he decided to emigrate to America, incidentally to Brooklyn, which was also Father Byles’ destination. Like Father Byles and Father Josef, Father Montvilla refused an opportunity to escape, and died shriving the faithful poor of Christ. The stories of Father Byles, Father Montvilla and Father Josef were remembered by the few who were rescued by the lifeboats from the icy water after the ship had gone down. May they all rest in peace, and, if God wills it, be raised to the altar to His greater glory, and for the edification of the faithful, for all of them died for love of Christ in His poor.